Laptops have already become a need for many people in the world because of its multitudinous nature and I would like to add that they never go out of style as well. There is this argument in the industry about PCs becoming extinct but they seem to be holding on every year. But with the advancement in the laptops in the market, the PCs are likely to head to the golden era real soon. Ultrabooks are very popular and the basic mainstream laptops still get the attention they need. 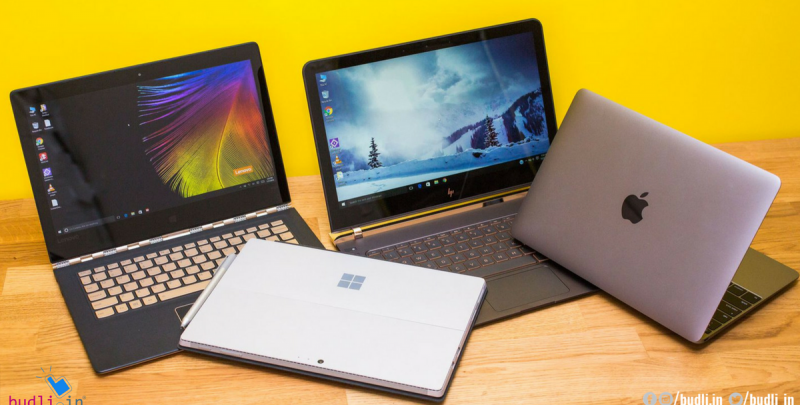 In this post, I am going to list the laptops which created a buzz in the industry last year. Dell XPS 13 is slim, light, powerful and majestic and is the best laptop on which you could invest. Dell’s 2017 flagship XPS 13 is one of the best laptops today. The Dell XPS 13 makes a significant impression through its powerful Intel Kaby Lake processors and ‘Infinity Edge’ display. You also get a choice of super high-resolution and multi-touch screens, and also options for storage and memory. Lenovo’s Thinkpad X1 Carbon 2017 update was a major hit and the company has redefined the standards for business notebooks. Last year’s edition of the Thinkpad X1 Carbon doesn’t compromise on anything, be it portability or performance. It’s smaller and lighter than ever, has a compact profile bolstered with carbon fibre, which means it is as tough as they can ever be, has all the I/O ports you will need and some small additions like touchpad improvements backed by Microsoft Precision Touchpad program. It is one of the most expensive laptops but it is worth every penny. The Asus ZenBook UX310UA is the perfect substitute for the more expensive Dell XPS 13 without big compromises. The body is an all-aluminium frame, and fast performance using the Intel’s 7th-generation Kaby Lake processor. There are additional options where you can choose between a full HD and an immersive QHD+ screen. This may not be exactly similar to Dell XPS 13 but manages to be quite good. This is the best MacBook Pro ever, now with Touch Bar. The latest laptop from Apple you can welcome home is the 13-inch MacBook Pro with Touch Bar. The eye-popping feature in the Touch Bar is a thin OLED display above the keyboard that can even be used for many other applications. If you are a fan of the MacBook Pro 2017, you will definitely be happy with this model. We would recommend you to invest in it if you are a die-hard fan of Apple and who has already invested in the company. The Microsoft Surface Pro 4 is the best laptop for people looking for the perfect mix of a nimble Windows tablet and a fully functional laptop. The base version of the Surface Pro 4 is a basic tablet and the Surface Pen or Type Cover keyboard are sold separately. The Surface Pro with the also-excellent Surface Book laptop is to Windows what the Pixel is to Google’s Android. It’s a high standard Windows device, with software and hardware working together in perfect harmony. The ultra-thin and light styled 13.3-inch version of the HP Spectre x360 packs the same hardy internal components of the 15.6-inch version in a more portable physique. Then coming to the keyboard, which with 1.3mm of travel, feels like a significant improvement. It has a dependable 8 hours and 45 minutes longer battery life and just when we thought there wasn’t a laptop that’s cutting-edge in every category, the HP Spectre x360 proved us wrong. There are many laptops out in the market with the latest features waiting for you to bring them home. The best place you can get the laptop of your choice at a more affordable price is budli.in. Visit budli.in and you will experience the largest online establishment of refurbished electronic products. You will be guided by the choices you can make, taking all your requirements into consideration. Budli is the best option you have to get a brand new laptop at a much lesser price than originally quoted.